The picture is framed by an arch and an entablature;the top part of a window, set within a deep reveal, protrudes into the picture at the bottom, beneath a plain entablature; its shutters are closed. A group of figures is arranged on the summit of Mount Parnassus. Apollo sits in the centre of the hill, a laurel wreath in his hair, playing a broad viol. To either side of him are the nine Muses, beautiful young women; their identities are not certain. 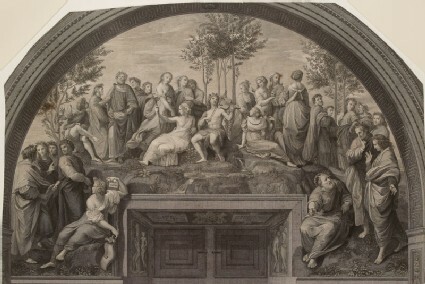 On the right are five, the seated Muse holding a lyre may be Terpsichore; behind her, left to right, the Muse holding a book may be Clio; Thalia, her right shoulder bare, holds a comic mask; Polyhymnia may be the figure beside her, pointing towards the left; and a final figure, her back to the viewer, may be Erato or Euterpe. On the left, the seated figure who holds a straight trumpet on her knee may be Calliope. Behind her are, right to left: Euterpe or Erato, who leans to embrace a Muse looking upwards, perhaps Urania; and Melpomene, who holds a tragic mask in her right hand, just visible beside Calliope's head. A series of poets are arranged to either side of Apollo and the Muses; again, not all of their identities are clear. To the right of the Muses, the plump young man looking to the right has been identified as Boccaccio. Just visible on the right edge, largely hidden by the foreground figures, is a plump-looking middle-aged man with long, fair hair, who has been identified as Jacopo Sannazaro. To the left of the Muses, Virgil points to the right with an outstretched arm but turns back over his shoulder to look at Dante, to the left, his characteristic long nose, jutting chin and hat with ear-flaps easily recogniseable. Just to the left and in front of Virgil, the old man with a white, curly beard and closed eyes is Homer. Below this group, in the foreground on the left edge, the short-haired man with a tasselled edge to his robe has been called Horace. The smooth-faced, hooded man peering over the shoulder of Horace's companion is Petrarch. The young woman sitting on a tussock next to the window holds a piece of paper in her hand, inscribed with her name: Sappho. Within the window reveal, on the left, a naked man tied to a tree-trunk, with another naked man behind him, apparently depict "Alexander the Great places Homer's 'Iliad' in Safe Keeping". On the right, a naked man rests one foot on a square block; a draped figure beside him, seen from behind, holds a hand to its head, representing "Augustus prevents the Burning of Virgil's 'Aeneid'". Above the window, in the centre, are the oak-branch arms of Julius II beneath a papal tiara and set against the pope's crossed keys, and the two plaques carrying the inscriptions. The engraving reproduces one of the walls painted by Raphael in the Stanza della Segnatura in the Vatican Palace, decorated for Pope Julius II from 1508 to 1511; the "Parnassus" was placed beneath the ceiling roundel of "Poetry". The print was first listed in the "Catalogue of Examples" of 1870, as no. 20 in the Standard Series, immediately following a photograph of the roundel of "Poetry" which decorated the ceiling above the "Parnassus" in the Stanza. It retained its position in the 1872 catalogue of the series. left: IVLIVS.II. | LIGVR.PONT. | MAX. right: ANNICHRISTIMDXI | PONTIFICAT.SVI | VIII. 20. Parnassus, or Poetry. (Raphael.) Line engraving, from the Vatican fresco. It sufficiently represents the character of Raphael’s conceptions in his strongest time; full of beauty, but always more or less affected; every figure being cast into an attitude either of academical grace, or of exaggeratedly dramatic gesture, calculated to explain to dull persons what they would never have found out from natural actions; and therefore greatly tending to popularity. 20. Parnassus, or Poetry. (Raphael.) Line engraving, from the Vatican fresco .